系統需求：Windows 10/8.x/7/Vista/XP/Server 2003/2008/2012/2016（32及64位元）Windows Terminal (Remote Desktop) Server and Citrix System. Classic Menu for Office - Show Classic Menus and Toolbars in Office 2010, 2013, 2016 and 365. Frustrated by endless searches for features on the ribbon? 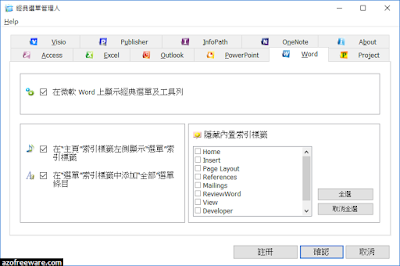 Download and install this software to bring back the familiar menus and toolbars to Microsoft® Office 2010, 2013 and 2016 (includes Office 365). The classic view allows you to work with Office 2010, 2013 and 2016 as if it were Office 2003.